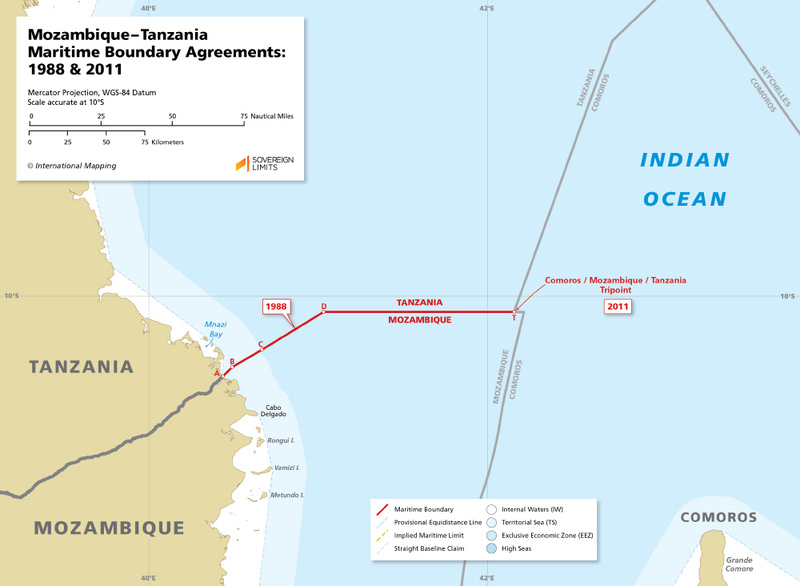 The maritime boundary between Mozambique and Tanzania was established by a 1988 bilateral Agreement and extends seaward for 108 M where it then terminates at the tripoint with Comoros (Point T). The line, which divides the internal waters, territorial seas, and exclusive economic zones of the two States, is comprised of lines developed using several different delimitation methodologies. Nearshore the boundary follows segments based on equidistance and directional bearings, while further from shore the boundary turns sharply at point D to head due east along a parallel of latitude. The tripoint with the Comoros (Point T) was established by a 2011 trilateral Agreement.